Winner, winner, rice bowl for dinner! Spice up your routine comfort meal and turn it into this amazing culinary relief. 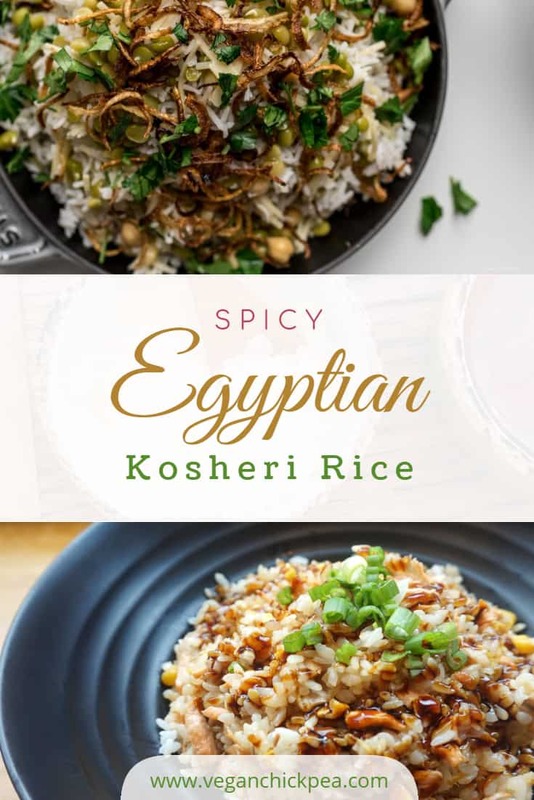 This surprising but oh-so-satisfying classic Egyptian kosheri rice is healthy and comforting – perfect to keep you warm and cozy during wintertime! 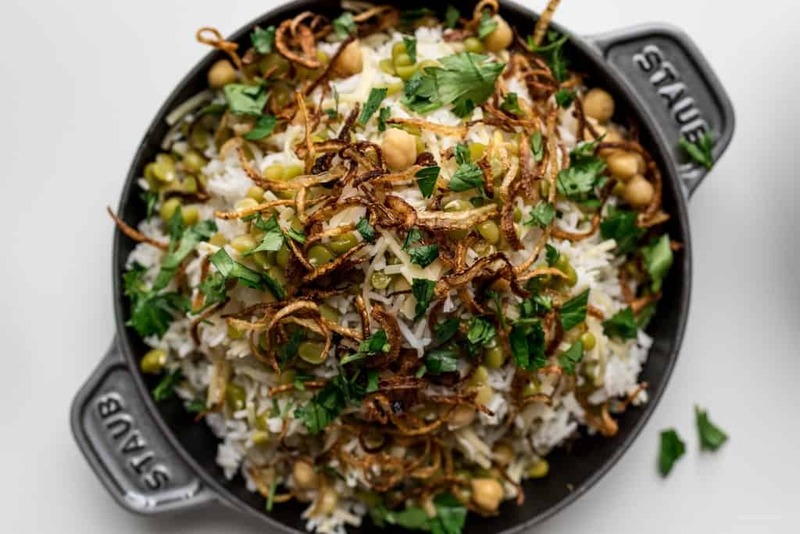 Topped with spicy tomato sauce, crispy onions, chickpeas and tangy garlic vinegar – this classic egyptian rice bowl is definitely one for the books! A must have recipe for vegans who love spicy things! Enjoy the full recipe here! Make the garlic vinegar dakka sauce by mixing everything together. Set aside. Rinse off the split peas and chickpeas. Place in a large pot and cover with water. Salt generously and bring to a boil, then simmer for 10-15 minutes, or until pulses are tender but still have bite. Drain well. While the pulses are cooking, cook the rice. In a pot, combine the basmati with 2 and half cups of water as well as a generous sprinkling of salt.. Bring to a boil over high heat, then cover and immediately turn down to low. Cook for 17 minutes, without peeking. Turn the heat off and let sit, with the lid on, for another 10 minutes. While the rice is cooking, cook the pasta in salted water according to the package. Rinse and drain well. While the carbs are cooking, heat up 2 inches of oil in a deep skillet over medium high heat. Add the sliced onions and cook, stirring occasionally, until the onions are crips and lightly browned (they will continue to brown slightly while out of the oil), about 5 minutes. Use a slotted spoon to remove from the oil, spread out, and drain on paper towels. In a sauce pan, heat up a bit of the onion oil, about 2-4 tablespoons, over medium heat. Add the garlic, chili, cumin, coriander, aleppo and sugar. Cook, stirring, for 1-2 minutes. Add the tomatoes and white vinegar and simmer for five minutes, stirring occasionally. Remove from the heat and season with freshly ground nutmeg, salt and pepper. To serve: build a bowl with the rice, pasta, and pulses. Top with fried onions, tomato sauce, and a sprinkling of dakka. Add lemon zest, lemon juice, and flat leaf parsley if desired. Mix everything up and enjoy! If you’re looking for a meal that’s super clean and fresh, made with healthy real foods, creamy and nourishing? Check out this list of healthy vegan recipes here.